Barkingside 21 : The Dead Zone? There is a fascinating report over on Bristling Badger which is taken from a site by Filatova Elena Vladimirovna, who has been exploring the Dead Zone around Chernobyl. Although there is some debunking in the comments at BB, that Elena has used poetic licence, the thrust of the piece seems to be quite sound. The official Dead Zone is a 30km radius but there is now no human habitation within a radius far wider than that. 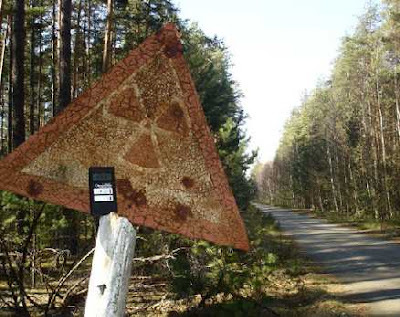 There are more than 2,000 dead towns and villages within a radius of 250 kms (155 miles) around Chernobyl reactor. Each year I travel, I see more and more ruined places. 155 Miles is the distance between London and Cardiff. What happened to those people on 26 April 1986? After a few hours trip in an army vehicle, they stood under a shower, washing away radiation. Then they stepped in a new life, naked with no home, no friends, no dogs, no money, no past and with a very doubtful future. They left behind treasured possessions, family heirlooms and family photographs and videos. All they had left was memories. But Mother Nature is having her say. Wildlife appears to be thriving in this forgotten land. Life indeed does find a way, but it is rather presumptuous to expect it to include us Hupersons, don’tcha think? Note: I wasn’t really up and about at 8am this morning. I am just testing out blogger’s facility to schedule a post for a later date and time. Is Redbridge THAT close to Chernobyl? "The dead zone" - sounds like the cranium of certain current cabinet members. Local, National or MFI? Or is that a dumb question?